By far, white is still our best selling colour in every door style we offer. So, it’s probably time we should talk about the All White Kitchen trend we’ve been seeing for the past year or so. (like our Elegance Shaker White), a textured backsplash tile or other textured wall features, like shiplap. Consider it more monochromatic than “all white”. Matching whites perfectly is nearly impossible. Choose multiple whites and allow the colours to differ slightly. It will make your project easier and give you a softer result. Account for maintenance. White is great and all, but know it will show every splash, every drip, every oops. 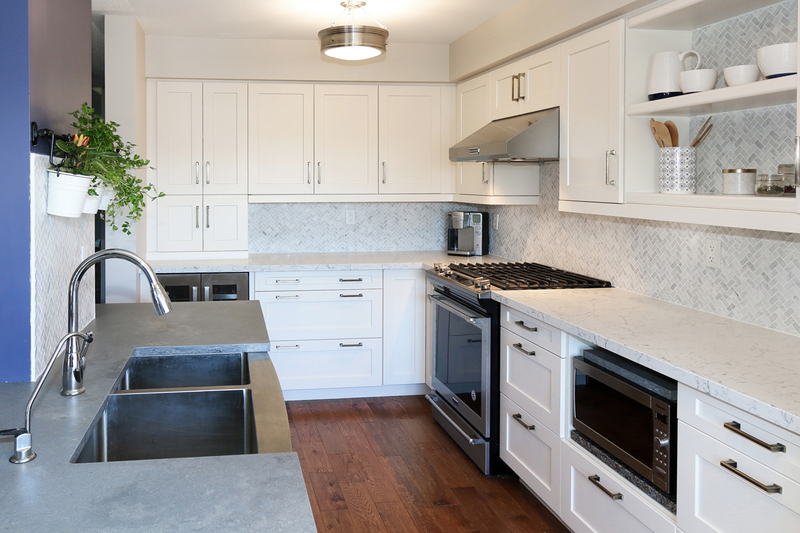 Wiping down your cabinets and backsplash (which may not be part of your normal routine now), will become part of your after-cooking clean up routine. If the thought of that makes you crazy, the all white kitchen may not be for you. Try not to use alkyd based paints in your all white kitchen. They yellow more quickly than latex and can have you painting your walls and ceilings every year or two. Don’t go for an all white kitchen just because it’s a trend, or because you feel like it’s a safe choice. Remember, the kitchen is the heart of the home, and you want your kitchen to reflect you. Always make the choices that fit you, your family and your home!